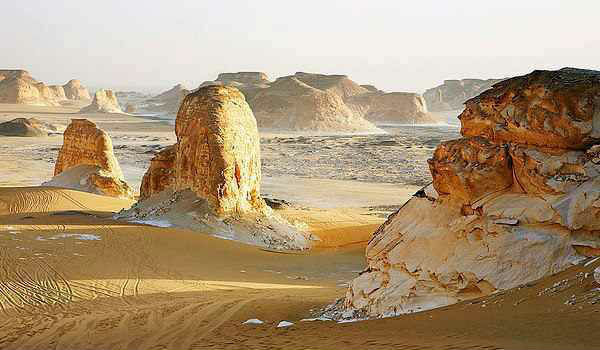 An overnight expedition to the Western desert of Egypt with private modern vehicle and expert tour guide to Bahariya Oasis approx. 360 Km south west of Cairo. Once you arrive there you will enjoy walking around the old village of Bahariya oasis to wander palms & fruit trees. Then move to the Black Mountains, explore the sand dunes and the salt lake then Continue to visit the Temple of Ain El Muftella and watch the the ruins ‘the English House’. Enjoy the sunset scenic view then transfer to the White Desert & overnight in camp. Shortly after breakfast you will head to visit the Crystal Mountain to admire the volcanic rocks & the petrified wood in Agabat Valley. Proceed onto the Black Desert and El Haize with its splendid hot spring. Then transfer back to the campsite at Al Haiz for overnight stay. .
breakfast at the campsite with amazing sunrise views. Later you will be driven back to Cairo. Book Egypt Adventure Holidays, 8 Day Safari Trips in Egypt to Siwa Oasis, Great Sand Sea Egypt, Bahariya Oasis, White and Black Desert Safari Trip Package to Explore the Great Sand Sea in Egypt Western Desert on the Borders of Sahara Desert.